This salad is a healthier alternative to the usual carb loaded potato salad that abounds in the summer season. Note that I say "healt-IER" as opposed to "healthy". This might possibly have something to do with the entire bottle of mayo I used to dress this. But hey, It was huge head of cauliflower and a mondo sized bunch of celery and I abhor dry food. The original recipe that this is adapted from called for a measly 3 Tbsp of mayo. I chuckled. Then I dumped in all the mayo I had. You have to have something in life, am I right? The tender cauliflower mimics potatoes as well as anything aside from actual potatoes. Crunchy jicima and celery add firm texture. The red onions lend the right amount of acidity. The eggs, with their unctious golden yolks, the smooth mayo, and the grainy honey mustard make up the unmistakable potato salad creaminess. The fresh dill makes the whole dish snap to life with flavor and freshness. 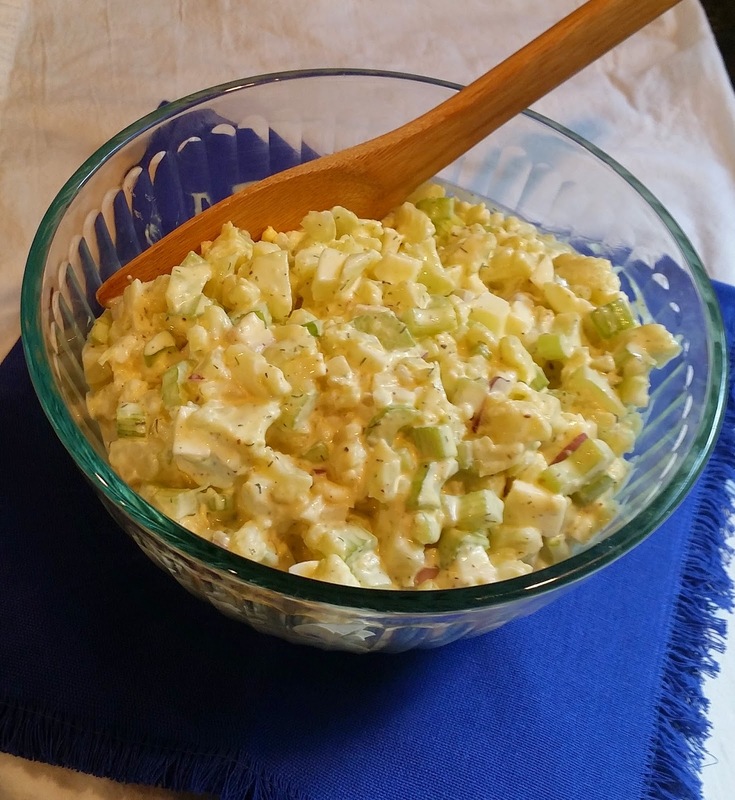 Make up a bowl of this for your next picnic, cookout, or just to jazz up an everyday meal at home. Recipe cred goes to my culinarily gifted MIL (who also added more mayo <grin>). Wash and separate the cauliflower florets. Steam them, lightly piercing them with a fork periodically to test. The cauliflower should be firm enough that you don't end up with mush but not too crunchy. Think potatoes. Slice the red onion into thin slivers. Soak the onion slivers in a bowl of white vinegar while prepping the rest of the ingredients. This will temper the strength of the onion. They will be bright without the mouth puckering burn. Good tip for any recipe involving raw onions. Drain well before adding to the salad. Dice the steamed cauliflower, celery, jicima (which you peel first, but duh, you knew that), and eggs. Put all diced ingredients in a large bowl (I despise mixing anything in a bowl too small for the job, sticking a bigger bowl in the dishwasher is much easier clean up than wiping up all the spills and sloshes from a smaller bowl, oversized is the way to go). Season generously with salt, pepper, and dill. Toss well. Squirt on mayo and honey mustard, as much or as little as you like. Mix, taste, and adjust the dressing level to suit your preference.